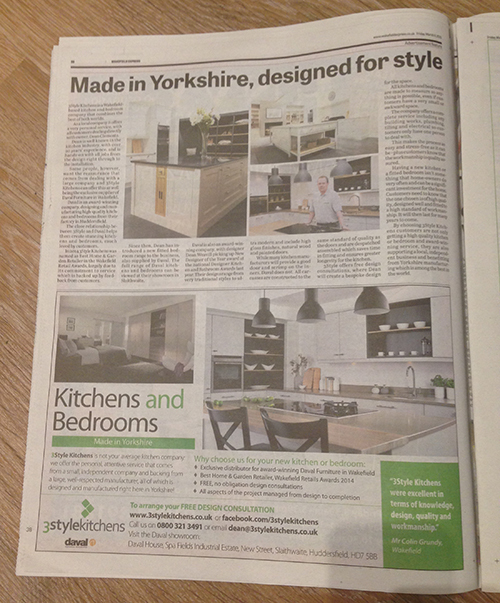 Kitchens and Bedrooms - Made in Yorkshire! You may have noticed the spread we had in the Wakefield Express recently. In it we talk about how proud we are to be a Yorkshire company that offers the true Yorkshire values of personal service and fair prices as well as great craftsmanship, as our kitchens are manufactured right here in Yorkshre as well. The personal service comes from Dean Clements, owner of 3Style Kitchens. When you choose us to provide your kitchen you work directly with Dean every step of the way. We also have big company backing. This comes from Daval Furniture who supply our kitchens and bedrooms. We are the exclusive Daval distributor in Wakefield. Daval is based just down the road in Huddersfield so it truly is a Yorkshire affair! We're both award winning companies as well with us having won Best Home & Garden Retailer in the Wakefield Retail Awards and Daval winning New Designer of the Year at the Designer Kitchen and Bathroom Awards in 2014. We've worked together for many years so it makes for a great partnership. If we can give your kitchen or bedroom some much needed Yorkshire glamour (!) then please get in touch. 2 Responses to "Made in Yorkshire!"